About Artist: "Artist for The People"
John produces Private and Public Art Commissions, Mural Arts, Portrait Art of Influential Persons in the Sport, Entertainment Industry, US and International Diplomats. His most liked are of Sport Athletes' and notable Celebrity Personalities. 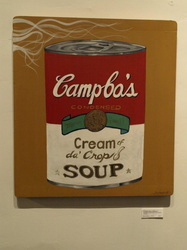 He primarily creates Portraits of Art of Pro Boxing's World Champions. 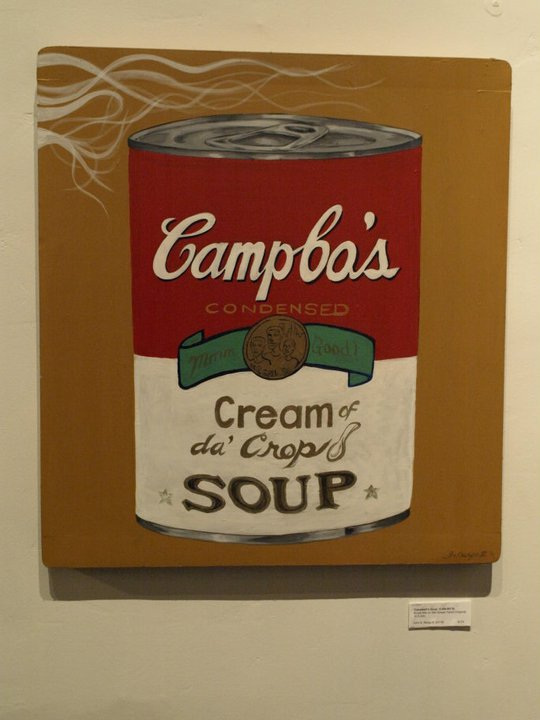 Government , Art Buyers, and Novice alike. Of the human subjects he draws, paints, and even sculpts, is in a bust to full figurative style in most in human as the subject matter in portraits of art as well as animal wildlife, and some abstract incorporated in a bit of an Abstract Expressionistic lose style of paint in his Studio Art and Live Art pieces which he performs ‘Live’ at Music Venues, Concerts, Wedding Receptions, Red Carpet Events, etc. Artist has been appointed to the US Department of State in the Official Artist Registry of US Visual Diplomats for the Arts in Embassies program founded by President John F. Kennedy & wife Jacqueline Kennedy Onassis in 1963 for American Artist to display their Works of Art in US Embassies around the World on Temporary and Permanent Exhibitions under the 3-year Tenure of the US Ambassador serving that US Embassy post. A Commemorative Works of Art commemorating the African-American US Air Force Fighter Pilots, The "Tuskegee Airmen" that flew into battle to protect the US Bombers as fighter pilot escorts that were a force to be reckoned with during the World War II Campaign. 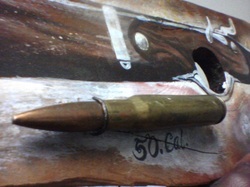 Their Iconic Battles were the stories of old of determination and during before the Civil Rights era, Artist John Barge III has used an actual authentic 1942 & 43 20 mm Caliber Shells mounted on plywood, hand-painted with "COFFEE GRAINS, KIWI SHOE POLISH, and Italian BALSAMIC VINEGAR, the former lethal Bullet has been emptied and mounted with Armature Wire and drilled into the disposed 5X7in Wooden Plank both art pieces were first displayed at sold at the Bunny Gunner Gallery a the famed Pomona Arts District's "Art Walk" on 2nd Saturday, February 2012. 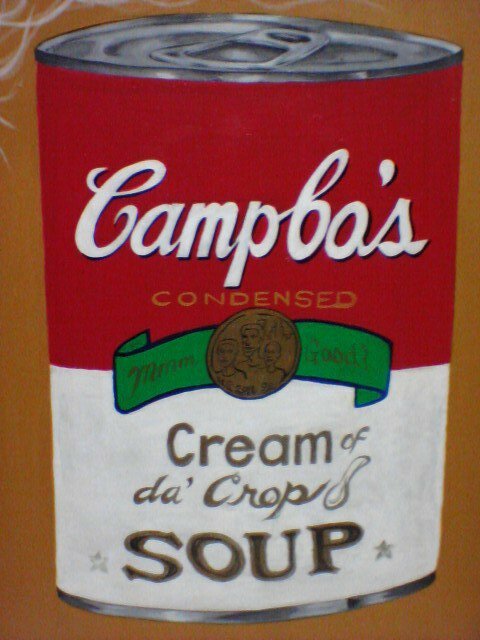 "Cambo's" (Campbell Soup a phonetical pronouncation) of the Word "Campbell," a voice sound of a non-discrimination of non-distinctive elements of Urban-American language. 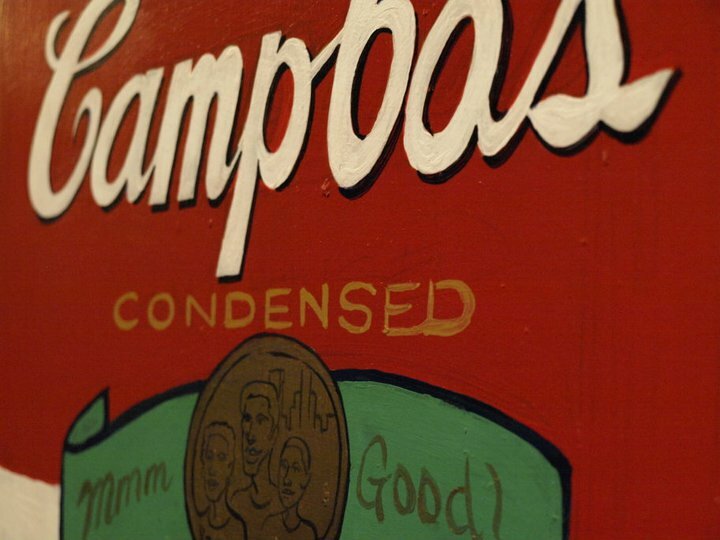 Canned soup provided one of main consumers of the iconic soup company during the Great Depression, and hard times. 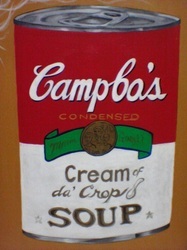 Artist influences of Andy Warhol's Pop Art of "Campbell Soup Cans" created in 1962, by Pop Icon Artist, Andy Warholwho took the familiar look of the Campbell's soup can and integrated it into a series of pop art silkscreens, a theme he would return to off and on through the 1960s and 1970s. The first batch in 1962 were a series of 32 canvases. Artist has used an actual silkscreen panel mounted on wooden frame, and hand painted his themed art piece influenced by the Pop Iconic Art. Works of Art of inspiration paintings, drawings, scuplting, mixed media works celebrating the 54th Massachusetts Regiment of the United States Military. The 50 Caliber represents the impact that the Afro-American soldiers' decisive victories in wartime battles during the American Civil War.